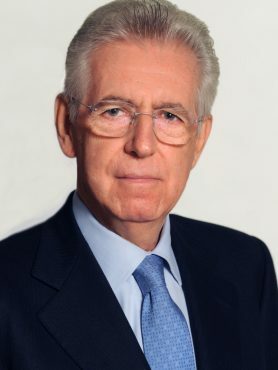 Mario Monti is currently President of Bocconi University in Milan and Senator for life of the Italian Republic. He was Prime Minister of Italy (November 2011‐April 2013) and Minister of Economy and Finance (November 2011‐July 2012). He served for ten years as member of the European Commission, in charge of the Internal Market, Financial Services and Tax Policy (1995‐1999), then of Competition (1999‐2004). He chaired the High Level Group jointly set up by the European Parliament, the Council and the Commission to prepare the report on “The future of EU finances” (published in 2017). At the request of the President of the European Commission, he prepared the report on “A new strategy for the Single Market at the service of Europe’s economy and society” (2010). He is honorary president of Bruegel, the Brussels-based European think tank he founded in 2005 with the support of the governments of Germany and France. He is a member of the Académie des Sciences morales et politiques, Paris. He is chairman of the European Advisory Board of Transparency International EU, Brussels. His publications focus mainly on monetary and financial economics, public finance, competition policy, and the economic and political dimensions of European integration. Born in Varese, Italy, in 1943, he graduated from Bocconi University and pursued graduate studies at Yale University. Prior to joining the European Commission, he had been Professor of Economics and Rector at Bocconi. Vers un choc des nationalismes ?